ProForm SMART Pro 9000 Treadmill Review by Industry Experts! The ProForm SMART PRO 9000 Treadmill Is On Sale! The ProForm SMART PRO 9000 treadmill is ProForm’s top of the line model. It comes with every premium feature that ProForm has to offer, and they have quite a few. The ProForm SMART PRO 9000 treadmill combines a heavy duty running machine with features that are designed to motivate and entertain you while you run in place. Since running in place can be boring, being motivated or entertained is a big plus. This newest “SMART” model was released in Spring 2018 and has several improvements over the older ProForm Pro 9000. Other machines in this line-up include the ProForm SMART Pro 5000 and Pro 2000. You may also want to check machines from ProForm’s sister company – NordicTrack. MID-WEEK SALE ENDS THURSDAY: The ProForm PRO 9000 is priced at $1,799 with Free Shipping, 1-Year FREE iFit membership, and a 30-Day Money Back Guarantee! Financing is Available. This is $200 OFF the Regular Price! * Inclusion of Live Trainer Led Workouts with new workouts everyday. Both Incline and Decline – Every treadmill has the ability to incline, but few allow you to also decline the deck. The ProForm PRO 9000 declines to 3%. This allows you to simulate going up and down hills and target additional lower body muscles. 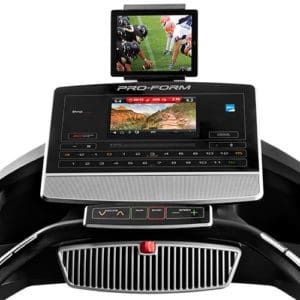 ProForm SMART PRO 9000 treadmill with a 10″ Smart HD Touchscreen display. 10″ Smart HD Touchscreen – This is the main feature that increases the price of this model over the ProForm Pro 5000. The 10″ Smart HD Touchscreen allows you to access the internet and view your iFit Live stats. The Pro 5000 only has a 7″ screen and costs about $500 less. iPad Holder – As seen in the photo there is a holder for your iPad or tablet above the display. 2.5” Rollers – Larger rollers are always better because they require fewer rotations of the belt. This reduces wear on the belt, the rollers, and the bearings. It can also reduce noise. 22″ x 60″ Treadbelt – At this price, the 60″ is standard, but most treadmills have a 20″ wide belt. The extra 2″ make a big difference. 4.0 Continuous Duty HP Motor – This motor is more than you’ll ever need. It will easily handle any sort of abuse you throw at it. iFit Live on the ProForm SMART Pro 9000 – View your workouts on a 10″ Smart HD Touchscreen. Create unique workouts that are geared towards your specific goals. Use the system to trace out a route using GoogleMaps and then run the path while experiencing the real life hills. Your treadmill will adjust incline automatically while you run. Check your progress on your online profile. This system allows you to set goals and track you weekly results. Warranty – The warranty includes 2-years labor, 5-years parts, and lifetime frame and motor coverage. Learn why it’s important to check your warranty. Heart Monitor and Control – The ProForm PRO 9000 treadmill comes with the ability to monitor your heart rate and determine the level of your exertion by the rate of your heart. It also comes with a wireless chest strap for continual feedback. Speakers and MP3 Input – ProForm has some of the better speaker systems found in treadmill consoles. Better music means a better workout! 40 Installed Workouts – You get a generous selection of installed apps that focus on exercises like high intensity, incline, speed and calorie-burn. As we initially mentioned, the SMART PRO 9000 is fully loaded, and that is what makes ProForm and its sister company, NordicTrack, the most popular treadmills in the industry. They offer extraordinary value. Compare the SMART PRO 9000 to a comparably priced treadmill and see what features they offer. Not many! What about the quality? The warranty suggests a durable machine that can withstand the abuses of running. This treadmill is designed to take a beating. If you are training for a marathon and care about extras, you may want to look at the Sole S77. But if you want a heavy duty running machine that will motivate and entertain, the ProForm PRO 9000 is your obvious choice. Other models in this line include the ProForm PRO 2000 and SMART PRO 5000. Of these two models, we feel that the SMART Pro 5000 is a tempting offer. You can save $500 from the SMART Pro 9000 and you’re mostly only getting a smaller 7″ Smart HD Touchscreen. 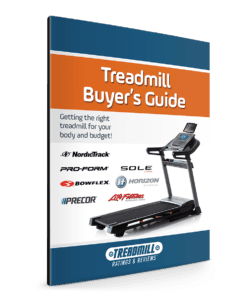 Check out our comparison chart of all ProForm treadmills here. I love my treadmill. It is the best one I have ever owned; and I’ve owned three. Pro-form is well built; I know it will last. The software is amazing. The combination use of iFit is a tremendous bonus; it makes working out fun and more challenging. The impact absorbtion is the best; in comparison an unknown brand treadmill I used while vacationing was like running on concrete.